Sandol Stoddard has enjoyed a celebrated career as an author of fiction and non-fiction. Her body of work is exceptionally broad in scope and totals twenty-six published books, with early works published as Sandol Stoddard Warburg. 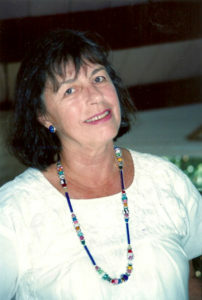 It includes award winning children’s books such as the best-selling I Like You, historical novels, lyrical adaptations of the Bible and Old English classics, as well as scholarly non-fiction reporting and analysis, such as her landmark work, The Hospice Movement, which played an important role in bringing hospice best practices to the United States. The following edited text of interviews conducted in Kona, Hawaii in May 2016 reveals a number of elements of her craft. When did you first discover that writing was a gift, a form of expression with which you could excel? I have a very distinct memory of my joy and excitement at the age of four when I discovered that I could save the words that were circulating in my brain. That is what writing was about: you could capture these insights, these words. I remember following my mother at our house on Blake Road in New Haven. I was pulling on her apron strings, literally, as I was hearing in my head the words “the spring is here, the robin is near.” I saw then that if you could do this strange thing called writing. A writer could make this memory of beauty endure, that these words and feelings and poetry could last forever. What are the origins of your first published book? The Thinking Book was really a strategy for getting my most precious thoughts and memories down so I could preserve them, so I could return to them. The book was first a poem. I created it for my own pleasure; it was only later that I realized I could publish it. The text was a reporting job from the unconscious. It captured some memories of my early life, the life I led when no adults were watching. In The Thinking Book, was your author’s voice that of the parent, or the child? (Laughing mischievously) Both! That was true of all my children’s books. Did you ever feel you had to compromise the integrity of your vision for commercial purposes? No. Actually there was an older woman editor in Boston who hated my first book. She thought The Thinking Book was all wrong. She apparently threatened to quit if Atlantic published it. She didn’t get it. I didn’t know if I was ‘old style’ or new style, I just wrote what I felt. A battle royal took place after this at Atlantic. I learned of the battle from a sympathetic participant, who was outraged. Then Atlantic declined my second book and I found my way to Houghton Mifflin, with whom I had a great relationship for years. How did you move from your daytime study of English literature to writing children’s books? I was just doing what I loved. In the process, I got lucky with illustrators. I had great ones. The only time I rejected an illustrator was really just one key illustration: the last page of I Like You had originally the two friends done up in wedding dress—which I felt ruined the whole message about friendship. I insisted it be redone and it was. It took months. In those days, we exchanged drafts by snail mail via our editors and it was a very slow process. How did you choose to publish some stories but keep others in the family, such as the Mr. Toodlebum stories? How did you then come to publish a series of books for adults? I was in those days studying in San Francisco to become an English professor. I so loved the language, the old English rhythm, the poetry. I wanted to make the lyrical phrases more accessible. Like the child in The Thinking Book, I did not want it to be cluttered with technical stuff. Also, I was getting divorced and my prospects for earning income as a single mother with four kids in the 1960s were not great. I needed to make money and I dreamed that I could do it writing both for adults and for children. At the time, my first ‘bridge’ effort came out, the translation and adaption of Spenser’s Saint George and the Dragon, I felt I had struck a chord when the Yale President Bart Giamatti told my skeptical father it was “first rate.” I took great pleasure in that observation. How did you juggle working on several book ideas at once? I didn’t. I was intently focused on the project at hand, one project at a time. We moved to a great old home in Ross (just north of San Francisco) in part because it gave me a writing office near the center of things where I could close the door. I would creep up on a block of time when I could turn on the voice in my ears, even when I was dead tired. There was no special time set aside; I just grabbed time where I could. How did you teach yourself the writing process? I just wrote and wrote, then turned on my critical voice as editor. Bryn Mawr and San Francisco State were facilitators. I learned how to edit when I was a student at Bryn Mawr. But I taught myself how to write. I never wanted an editor. Houghton Mifflin loved my work and the editors rarely proposed to change a word. There were several authors and teachers and editors who encouraged me greatly… Leonard Wolf, Matthew Evans, Paul Brooks and Emily McLeod. And of course I tried out all of my children’s books on my four children. These books were at first very private. I had to get into a certain mental space. It was a frame of mind that was very hard to maintain, hard on my husband, hard even on the kids around me. Could you have written children’s books without your own kids? Actually, yes. These were stories and wordplay from my own head, from when I was a child. It was not a happy childhood. My joy in words was ignored by grownups around me. Yet this was the best thing that could have happened to build my determination as a writer because it forced me to reach down and find my own voice. Was there a particular breakthrough? Yes, in the summer of 1957 on Massachusetts I had some time alone. As I read the works of Margaret Wise Brown, I felt her success gave me permission to write the way I wanted. I saw in her work, especially Goodnight Moon, that I could present my work in a similar fashion. I could combine poetry with narrative. I could present a story as a song. I could write what is beautiful, what is good. She was a poet. She did not try to write like anybody else. I saw also from her success that I could sell my work. Were the lyrical words, the poetry, in your head when you started a book? Or did they follow on as the story developed on paper? About half and half. I just could not stop writing it down, then when I tried the stories on my four young boys and read them aloud, they loved the rhymes. Even when I was editing my own work, I had a track in my brain that read the words as if out loud, so I could hear how it would sound. What did your parents think of your early work? They were totally confused. The voice, the point of view in my work, was that of the child, the celebration of beauty in the world. In this sense, my writing was—and is—fundamentally an act of rebellion. Later, with my commercial success with books such as I Like You and The Hospice Movement, my parents were horrified that I was becoming something of a public figure. They felt that a lady’s name was not supposed to be in the newspaper in those days, except for marriage and death notices. What was the process by which you crafted your books? What came first, plot, or characters, or the poetry of the words, or pictures you imagined? (Scoffing) None of the above! There is no formula, no short-cut. Writing is mysterious; I am not sure I can give a formulaic answer. It is really a process of getting stuff out of the way so the words can be clean and understandable. I had wanted to be a writer since I was 14. I kept asking my parents for a place to write, a corner or an attic, anywhere I could find quiet. Finally, I found a decrepit barn infested with mosquitoes near our summer place on Martha’s Vineyard. My parents were deeply suspicious and thought I was rather crazy to want to write. As a writer, I needed to get Self out of the way and surrender to the image of what is was I wanted to create. Then I would just get into a zone, a zone of devotion if you will. Once in that zone, I felt I was devoted to the end purpose of the writer’s effort, I could relate to the Muse within. You have to listen very carefully to what the end product is trying to be, what it is trying to tell you. If you spend too much time thinking about yourself, you will make rotten art. Is there a favorite of yours among the twenty-six books? I cannot really pick one: they are all standing up and yelling! Yes. I wrote Mrs. Kennedy and asked if we could use a still photo of that moment for publicity. She wrote back very politely and declined, because she did not want an image of her children used commercially, which I completely understood. What is your earliest memory of pleasure from books? My Aunt Sandol gave me collections of stories and fables, including Treasure Island and The Princess and the Goblin, with gorgeous illustrations by Kirk, or by Wyeth. My parents did not read to me. But I had a trick from a young age, a gift—I could project on a blank wall wonderful scenes, escapes from a world where a child’s view was not valued. I exalted the child’s perspective, the purity, the innocence. Aunt Sandol was rare in that unlike so many others, she did not scorn the things that were important to children. Were there classics you did not appreciate? I don’t appreciate most of the modern works where adults pretend to be children. To me, the voice rings false. I try to let my inner child’s voice out to play, to create. How has the world of publishing changed? Ugh. It has gone to crap. I mean, it is like asking me to discuss “the spiritual gifts of Donald Trump.” There is just no ‘there’ there. Back in the day, when I came to Boston to see my publisher, my editors would celebrate the work. Once they packed a picnic lunch and took the whole family to eat on a tablecloth by the swan boats in Boston Common, just to engage with their writer. Sadly I find that today, the industry has no soul. It is almost exclusively corporate and bottom-line, money driven. The greed has exalted the cheap stuff. What role did your personal search for faith and exploration of religion play in your development as a writer? My personal faith is still under development. Doubleday approached me about the Bible stories. They came to me out of the blue because they admired my body of work. They handed me a fascinating and lucrative job on a silver platter. At first I said “who am I to do this, the Bible?” Then, I thought, “I can do this.” My books were not so religious in the sense of getting people organized around a specific religious dogma. But yes, of course they were, in the sense that they celebrate the spiritual. What is the unifying theme of your works?